Starscream commands one of the most fearsome military units from Cybertron: The Seekers. The squadron has brought him great power and glory, but that means nothing as long as Megatron is the one who rules the Decepticons. 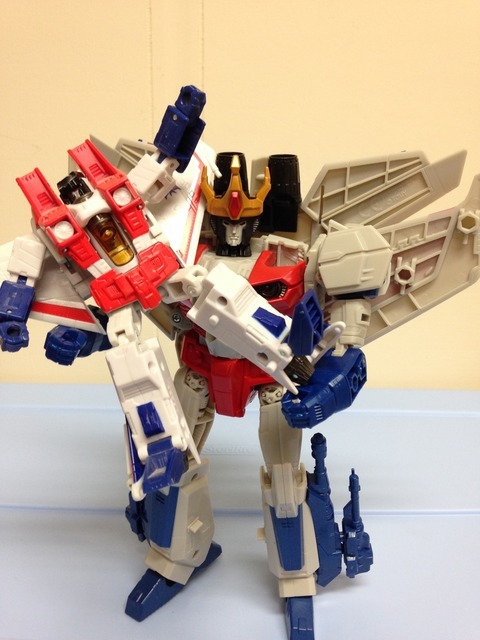 Until Starscream can claim that throne, he will have to be content to be king of the Seekers. Out of all the characters created in Generation 1, Starscream is my favorite. That wasn�t always the case � as a kid I loved Optimus (as all kids do). Within the past 10 years or so, I watched the entire run of US G1 cartoons, and could really let it all sink in. Starscream�s character on the show is fantastic. He's a bit of a buffoon at times, but his ambition is clear, and the folly of it all is what makes Starscream fun. He�s no mindless brute; he�s rather cunning, and finally gets a chance to shine in the 1986 Movie� and abruptly gets disintegrated. It�s a classic scene, and luckily for fans, he made a hilarious return as a ghost later on. It also didn't hurt that the great Chris Latta provided a wonderful voice for Starscream throughout the series. Long live Starscream! Starscream�s alternate mode is a modified Lockheed Martin F-22 Raptor fighter jet. The jet mode is sleek and well designed, with a good amount of detail throughout. Detailing is simple, with clean panel lines here and there - which seems accurate for a fighter jet. The drawback to most mass retail Transformer jets is the visible robot parts that are not well hidden... and Starscream is no different. Most of the parts are 'hidden' underneath the jet, but the robot is really just tucked underneath. I don�t think it�s enough to be a deal breaker, but it is obvious and should be noted. The issue is that while these parts are �tucked away�, the bottom of the jet mode is fairly chunky, which diminishes the concept of aerodynamics. Ultimately, this is still a toy, so I'll let it slide. 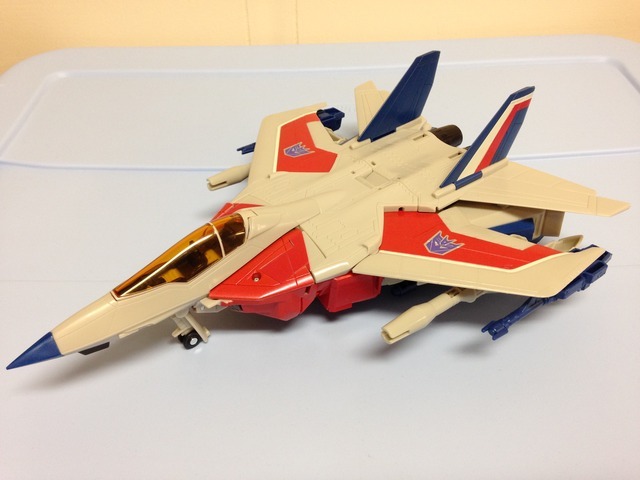 Aside from physical aspects of the jet mode, Starscream has a fantastic paint aesthetic. 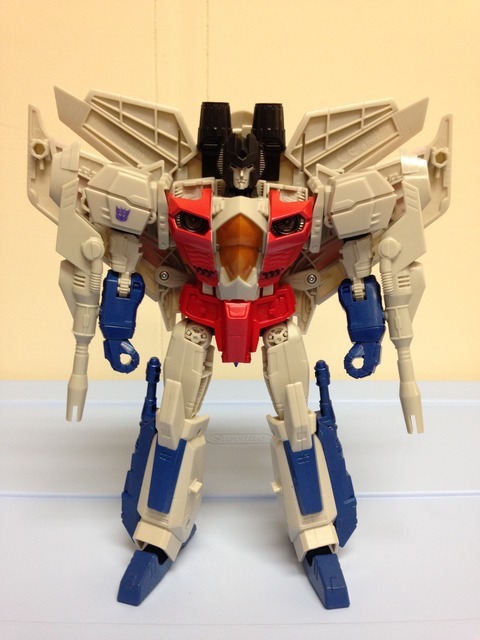 The main plastic color is light grey � the tone of which is spot on for Starscream. The jet (mostly in the wings) is accentuated with the character�s traditional red, blue, and white color scheme. Red makes up most of the detail, with blue right behind, and finally some white minor detailing. The red is a tad mismatched between the paint and molded plastic parts. Otherwise, the paint lines are clean and vibrant, with sharply detailed Decepticon symbols on each wing. The cockpit hatch is a clear yellow color, while the seats on the inside are black. The cockpit has enough contrast to stand out while also showing a good amount of detail. As for play value, the jet mode does quite a bit. The previously mentioned cockpit opens, though it�s a bit tricky to pull off. I always feel like I�m going to break it, but it�s fairly robust and has held up well. 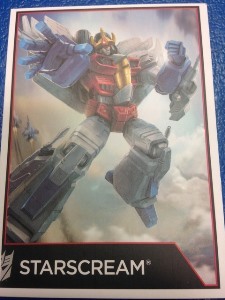 Starscream comes with a combination of six missiles and guns (3 matched on each side) and a blaster with a spring loaded missile that can attach to the front tip of the fuselage. All of these weapons store nicely under the wings in jet mode. Rolling wheels are present on the back end of the jet, and the front landing gear folds down as well. The only problem with the accessories is that the included crown has nowhere to be stored while in jet mode. It�s a poor omission, and it would have been great if Habsro�s design team could have found a place for it to reside. The transformation to get Starscream from jet to robot is fairly simple for such a large Transformer, but it has just enough complexity to maintain some fun. 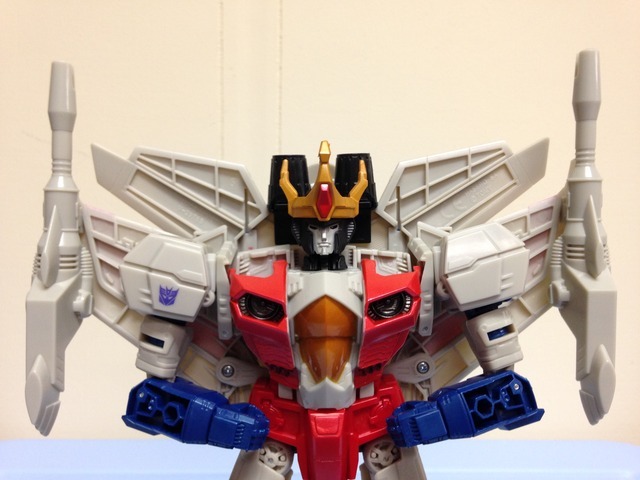 If you already have Jetfire or any of the other Seekers of this mold, you won�t find anything new here. The chest piece flips and folds in an interesting way, but the legs simply swivel up and tuck into the sides. The only issue I have is the quality of the plastic. While seemingly sturdy, the plastic seems like it�s on the brink of brittleness. I haven�t run into any issues, but for some reason I feel like something may snap. Otherwise, everything tabs in well, and you�re left with a solid robot mode. Which brings me to the play features! The crown is what ultimately made me pull the trigger on this purchase. Would it have been cool to get the purple cape too? Sure. But I�ll take what I can get. The crown doesn�t 100% match the cartoon version, but it�s fairly close, and it�s amazing that it was included. It tabs into his head well, and brings some of that ambitious Starscream character right to your shelf. On top of that, all the aforementioned weapons can be utilized in robot mode, and can be pegged into various spots. Two small blue blasters (arms or legs), two other bigger blue blasters (legs), two grey null-ray arm cannons, and one large blue missile launcher are included. All of these weapons have 5 mm pegs for fitting into the hands or in various spots around the body like the wings, the legs, and the forearms. All of the blue weapons can also be stacked into one BFG. These features add a level of play to this figure that made me smile, and really feel confident in my purchase. The articulation is also quite good. There aren�t any big hindrances to be found, and Starcream can get into most positions you can imagine. The shoulders/arms have 4 points of articulation (POA), the hips and legs have 5 POA, and the neck has 2 POA. The range of motion is quite good, and I haven�t found much I can�t do with him � most positions are also supported with his giant feet, tight joints, and great weight distribution. The only issue I have is the lack of swiveled wrists - that is a horrible design flaw. The design of the arms could easily accommodate this, so it�s sad that it was omitted in the figure. Transformation Design: 7. It�s simple and non-frustrating, but the chest folds in an interesting way. Durability: 6. Starscream seems sturdy, but the plastic used seems nearly on the brink of brittle. Fun: 10. He�s got weapons galore, and two great modes. Plus a crown! Aesthetics: 7. I really like the look, and the paint apps are fantastic. There�s a few issues here and there that purists won�t like. No smirk on the face though . Articulation: 8. Good range of motion, good balance, no hindrance. But the wrists are not jointed, which is a shame. Value/Price: 8. Good value for the money, and it doesn�t break the wallet like the MP version. Overall: 7.5. Don�t take the negatives in this review as a bad sign. 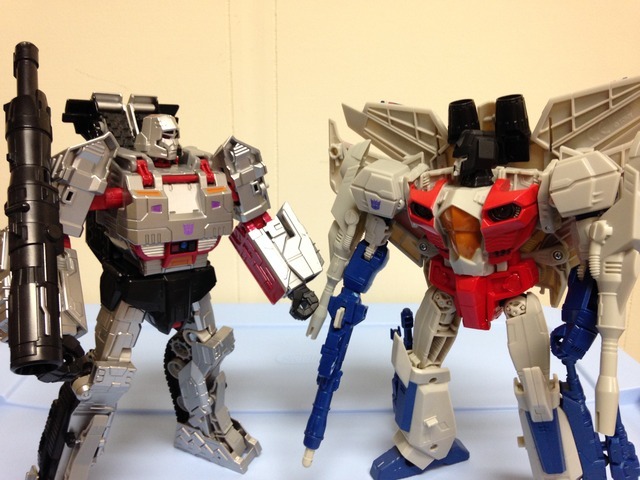 I�m very happy that I have Starscream in my collection. If you take a chance on him, I think you�ll like him if you can live with the issues. I don�t feel like there is anything in this package that tells me you shouldn�t give him a chance � just realize he�s not perfect, but he is quite good.